Needless to say, I’m in heaven as I plant annuals this year. Purple and white rule! 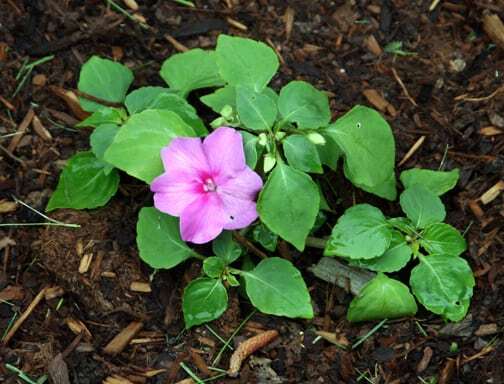 When ordering seeds for purple-flowering plants I came across a description and photo of Xtreme Lavender Impatiens. They looked fantastic so I ordered these seeds, along with a couple shades of purple zinnias. The zinnia seeds had very poor germination, but the impatiens all spouted and grew. They were happy, healthy seedlings. “You’re growing Impatiens from seed?” one garden visitor asked incredulously. I said that these were Xtreme Lavender, for the wedding, and all who heard were in agreement that it was worth it. The plants grew well and three weeks ago I planted them in the garden. Last week the first flowers appeared and damn it, they are pink. They are pink, pink, PINK…not even as lavender as the Blue Pearl that I could have bought from the garden center with my employee discount! Life is filled with letdowns, and this is one. I’m sure that my gardens will be beautiful for the wedding, pink Impatiens and all, but for now I’m Xtremely disappointed. There is no way in hell that this flower can be called Lavender. It's not even Xtremely pink...it's just Xtremely Annoying.